Most police departments, federal and state agencies have a written entrance exam that you must pass in order to be hired. Some departments give their exam on a regular scheduled basis while others may only give it once every year or two years. You usually have to register to take the exam but some cities allow you to "walk-in" and take the test. In some cases, you may have to pay a small fee of around $25 to take the exam. Generally speaking, the higher you score on the test the sooner you will get an interview. Most exams are between 75 - 150 multiple-choice questions. The exam usually consists of several parts and each section of the test may be timed. The entire exam will take about three to four hours to complete. The exams vary depending on what type of job you are applying for. Federal exams ask more judgement type questions. State and county exams focus more on traffic maps and patrol tactics. Exams for a city police officer usually will ask a lot of general knowledge questions. In addition to the written exam, some departments also give applicants a video test. You will watch a video of a law enforcement related scenario. As the police officers start to deal with a subject, the video will pause asking you what you would do. You will then be presented with multiple choice answers that will appear on the screen. The scenarios are usually designed to test your judgement and reasoning abilities. For more information check out police & law enforcement Situational Judgement Test (SJT) - practice, resources, and advice. How can I prepare for the written portion of the police entrance exam? Preparing in advance is very important for anyone who wants to become a police officer. The first step is to visit the site of the police department you are applying to. Look through the information and gather as much info as you can about the application process. Pay special care to try and figure out who provides the test. Some common providers of the entrance exam are the B-PAD Group, Darany & Associates, CWH Research, and EB Jacobs. 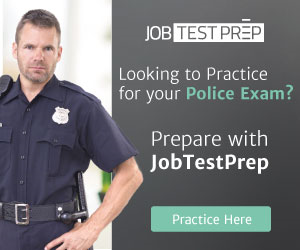 Once you figure out who the test provider is, you can start to practice for the written exam itself by searching through the police exam by assessment company. Taking practice tests is a great way to know what to expect on the testing day. By taking practice exams you can figure out your strengths and weaknesses. You should spend more time on weaker areas, this can help optimize your study time. 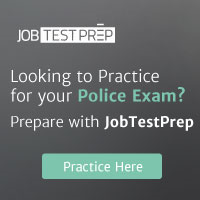 Check out police exam practice tests to give you a taste of what to expect on the exam. Listed below are some links to various types of sample tests. Even though you may not be applying with these departments, you should visit these sites and take the sample tests to get a better understanding of the type of exam you may be taking when applying for a job.